- Preheat oven to 180ºC (350ºF). - Remove giblets from duck. Cut onions and apples into chunks. - Mix with the ginger, maple syrup, salt and pepper. - Stuff the duck with this mixture. Place in a roasting pan and add the broth. - Cook covered for about 2 hours. Uncover and cook for 30 more minutes. Baste frequently with the pan juices and add water if necessary. - Remove the cooked duck from the pan and set aside. Skim the fat off the pan juices. - Mix the cornstarch with a little water until smooth. Pour into a saucepan. Heat, stirring in the pan juices. Mix until smooth, add salt and pepper to taste. 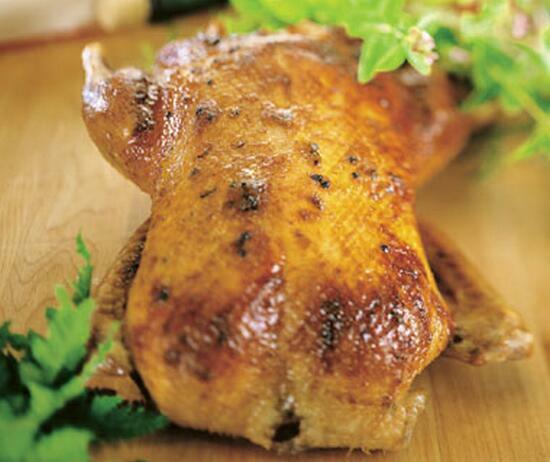 - Present roasted duck on a serving platter and serve the sauce in a sauce boat.